Whereas in Jamaica the Roots Reggae only recently has started to re-emerge with the "Reggae Revival" movement, it has never been absent in Europe. At least not for the last ten years. Thanks to Jahcoustix, the Africa-American-South American raised German globetrotter who has always kept up the flag of the original sound despite the constant rumours of Roots being a dying genre. While Jahcoustix has always resisted to switch to the allegedly more lucrative Dancehall he has never shyed away from experimenting with world sounds or even pop influences but has never lost his focus on Reggae. Now, in the 10th year of his career, all experimenting is over. "It's a serious record", he describes his 6th longplayer Frequency and in fact, this album is serious Roots Reggae music. Composed by himself and the Austrian production team Irievibrations with additional compositions of old comrades from Jahcoustix' early Dubious Neighbourhood days (his former band), Morry (now bass player for Dub Inc.) and Pollensi (now keyboard player for Gentleman's Evolution band), Frequency leaves no Roots lover's wish unfulfilled. This does not "only" apply to the musical aspect of Frequency but also and especially to the more than deliberate choice of combination partners. Horace Andy represents the Reggae greats, Kabaka Pyramid the upcoming new Roots generation. Jahcoustix could even win the hero of his teenage days, Israel Vibrations' Apple Gabriel for a very, very rare guest appearance in Controller. 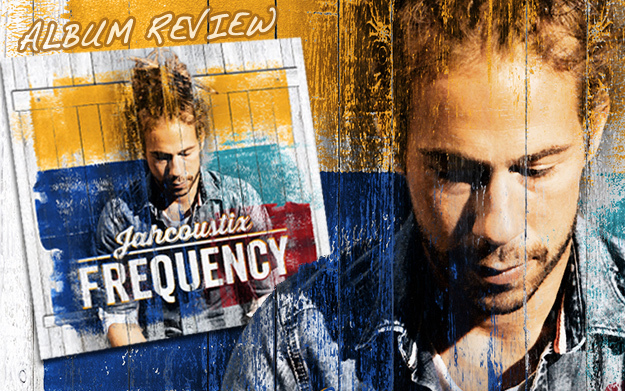 Whereas Jahcoustix describes his lyrics as "positive and life-affirming", Frequency boasts with deep, thought-provoking texts which makes the album not only pleasant for the ear but also a treat for the demanding listener who expects lyrical depth. Explaining the meaning of Frequency, Jahcoustix says: "Everything you hear and see is based on a frequency and sums up to what you feel". Absolutely right. Listen and you will feel it, too. For sure.